Content by Tony Macklin. Originally published on November 23, 2012 @ tonymacklin.net. A lot of movies sputter or fade at the end, but occasionally a surprising denouement raises a movie to another level. It reverberates back through the work and lifts it to a new sensibility. Life of Pi is such a work. Up until its clever revelation, Life of Pi is an ordeal. Its ferocity is not as graphic as the book's, but it is relentless and disturbing. But the ending changes the tone. It becomes elevating and thought-provoking. And eventually satisfying. As in religion, metaphor prevails. Life of Pi is not a shaggy-tiger story. It is a tale of tantalizing imagination. 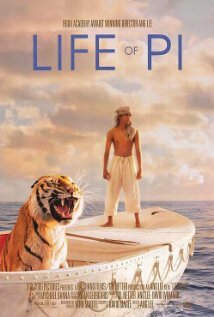 Life of Pi is the story of Piscine "Pi" Patel (Suraj Sharma) the son of a zoo keeper (Adil Hussain) in Pondicherry, India. After the zoo fails, the Patel family takes the animals on a Japanese ship headed for a new life in Canada. When the ship is hit by a violent storm, Pi escapes in a lifeboat, with a few of the animals, dominated by a Bengal Tiger, erroneously named Richard Parker. The teenager and the fearsome tiger fight for survival as they endure warily together for 227 days on the immense Pacific Ocean. Life of Pi is about their evolving relationship, fraught with danger and the unknown. At the beginning, Life of Pi makes sure we know it's not Disney. The animals are predators and prey. But, ironically, the ending is more Disney than Darwin. When Pi and the tiger reach an island overwhelmed by meerkats, I half-expected to see Thumper. Screenwriter David Magee makes a deft adaptation of the novel by Yann Martel. The book is much more bloody and vicious than the movie. Director Ang Lee chooses to avoid bloodletting. But the violence is still powerful and disturbing. Magee also cuts the allusions to the "blind Frenchman," and the discussion with him in the book. And Magee makes the writer (Rafe Spall) more of a participant. Suraj Sharma is convincing as the 17-year old Pi. He is both naive and cagy with the tiger. Irrfan Khan is very effective as the adult Pi, who is telling the story. The artists and technicians create marvelous effects. Cinematographer Claudio Miranda and production designer David Gropman lead the masterly stylists. Life of Pi is a phantasmogoric vision. Its 3-D effects are mesmerizing, harrowing, and sometimes spellbinding. The film belongs to Ang Lee and his Bengal Tiger. Life of Pi is cinematic tiger's milk, nourishing the art of film.